For the first time ever, according to press reports, Satanists will brazenly parade their 9-foot tall, one-ton demon-statue on the Arkansas State Capitol grounds. I wish this was just a bad dream, but it is true and happening right here in America. The Satanic Temple plans to publicly unveil its Demon-Statue near the famous 10 Commandments Monument on August 16th. 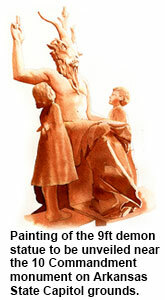 Satanists have also requested a court-ordered placement of the statue right next to the monument. HELP US to Prayerfully and Peacefully oppose this! John, is this the America that you and I know? This is totally outrageous and we must act fast! As I am rushing this email out to you, my fellow America Needs Fatimamembers are gathering a group of volunteers to stand up for the Faith and just plain decency. As of now, we have 62 volunteers going. We also have other volunteers from the area who will be joining our protest. 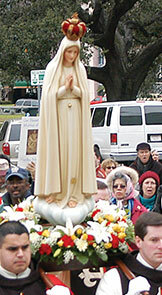 And we will be taking a large statue of Our Lady of Fatima. She who crushes the head of the serpent. We are hiring two buses to travel several hundreds of miles to the Arkansas State Capitol. Others will be flying to help in this effort. And we are desperately trying to find affordable accommodations and meals for all those present at the Rally of Reparation. Can you help this effort? Please click here to sponsor this Peaceful, Prayerful Rosary Rally of Reparation. I am sorry this is such short notice. And I know most folks are just trying to enjoy what is left of their summer. But how can we Catholics – in good conscience—just sit back and allow Satanists to parade a 9-foot statue of Satan in our cities? If we don’t do this Rally now, what will next summer look like? Might there be a demon statue in your town? This demonic procession – a type of sinister, multi-state caravan – with its idol of Satan in tow, will attract real devils as it makes its way from out of state en route to Arkansas Capitol grounds. Join me and become an American Against the Mainstreaming of Satanism. Click here to join the effort to keep SATAN out of AMERICA! Help our nation to remain – always! – one nation under God!